Since I’d read a couple blog posts reviewing Just Burgers, I already knew the difference between the “regular” burger and the “mini” burger option on the menu (hint: it’s not what you would think… the “regular” is really two patties, whereas the “mini” is just one. Rather misleading, I’d say…) Since I figured most people just walking in off the street, who hadn’t read blog reviews of the place, would automatically choose the “regular” burger, I ordered it for myself - even though, as I saw them toss the two veggie patties on the grill, I knew one (the “mini”) would have been plenty filling for me. 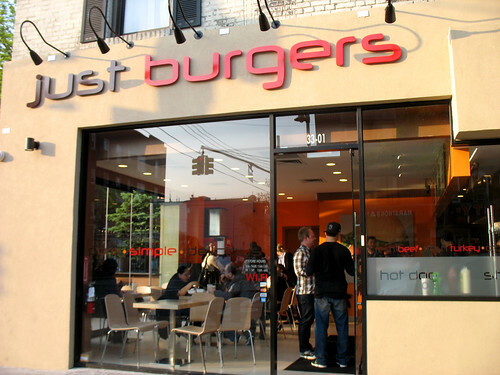 Speaking of the grill, I was initially very impressed to see that Just Burgers uses a separate grill for their veggie patties and buns, and does not grill them on the same surface as their meat burgers. The grill is right behind the counter where you order, so you can see everything that is going on. Unfortunately, just after I had admired the separate grilling surfaces, I saw one of the cooks use the same metal flipper he had used on the hamburgers to flip my veggie burgers. I realize this probably happens with the majority of the vegetarian food I order when it is cooked in the same kitchen as meat – and I don’t personally police my food so strictly that I ask about that, or that I would refuse to eat it (I tend to date omnivores, most of my friends eat meat, and I have barbecues at my apartment with a “bring your own meat” policy and let my friends cook their meat on the same grill that I cook veggie burgers on. Life is too short to be uptight). 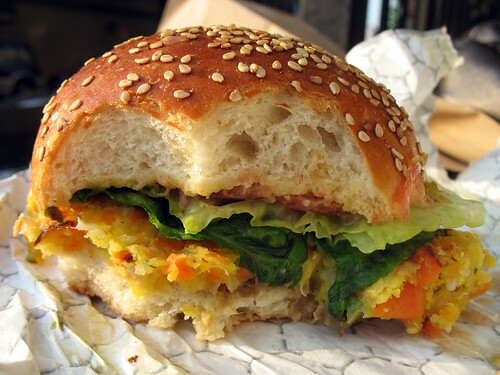 But I realize many vegetarians and vegans feel differently than I do about this – so I want to make sure I make them aware of how the food is prepared at Just Burgers. And, honestly, it annoyed me too – because really, if they are already cooking the vegetarian food on a separate grill, would it kill them to have one or two dedicated flippers that are not used on meat? But I still ate the burger - I had selected lettuce, tomato, chipotle aioli, and jalapeno relish from the selection of “free” (well, included in the cost of your burger) toppings, and then splurged $1 extra for fresh avocado. I’m a pretty big fan of menus that give you a wide variety of toppings to choose from – and Just Burgers definitely offers that. I especially enjoyed the jalapeno relish, and all of the toppings were fresh and delicious. The patties (remember, the “regular” burger came with two patties!) 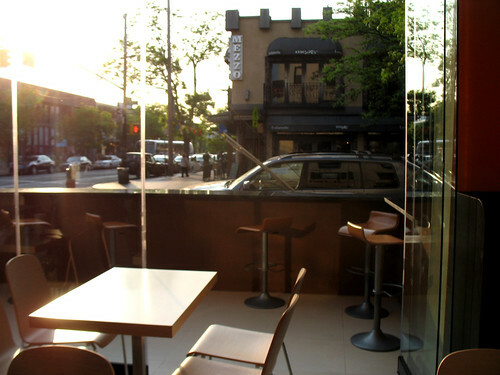 were definitely higher quality than you would expect from a cheap and quick burger joint. They are made with quinoa (which none of the staff knew how to pronounce) and “daily fresh veggies” – which seemed to consist primarily of carrots. I asked the staff if the patties were vegan, and they confirmed that they were – although they were not sure if the buns contained dairy or not. Each patty was definitely large enough to be satisfying on its own, so if I come back here I will assuredly only order the “mini” burger next time. They were a bit too soft, no crispiness on the outside – and fell apart quite a lot as I ate my way through the burger. But the flavor was still very good. I ended up with a “regular” bun because I was so distracted by the unfamiliar menu with so many options to choose from for toppings, that I didn’t realize until after I had placed my order that I could have chosen a multigrain bun instead. I asked if they could change my order while the patties were being cooked, and they assured me that they would, but I still ended up with a plain sesame seed bun. I can’t blame them for that too much though, since I did confuse them with the request after my order had already gone though. While the buns may or may not contain dairy (the staff couldn’t tell me for sure), the girl who took my order did mention that they will serve the burgers on lettuce instead of bread – so you could conceivably order an entirely vegan burger from them. I'd be annoyed with the dude using the same spatula to flip too. I don't usually care about things like that, but if they're going to the trouble to cook on a separate grill, they need to do it right. Right? 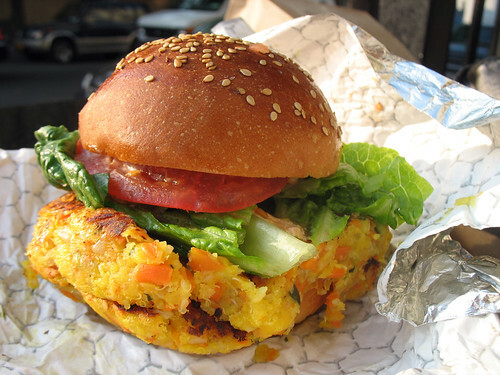 Anyway, the patty looks delicious. Love that yellow color. HOLY COW that looks yummy!!! I want. no need. must have!